eLighters: Quality Lighters & Smoking Accessories: Learn How to Gift Wrap with eLighters! 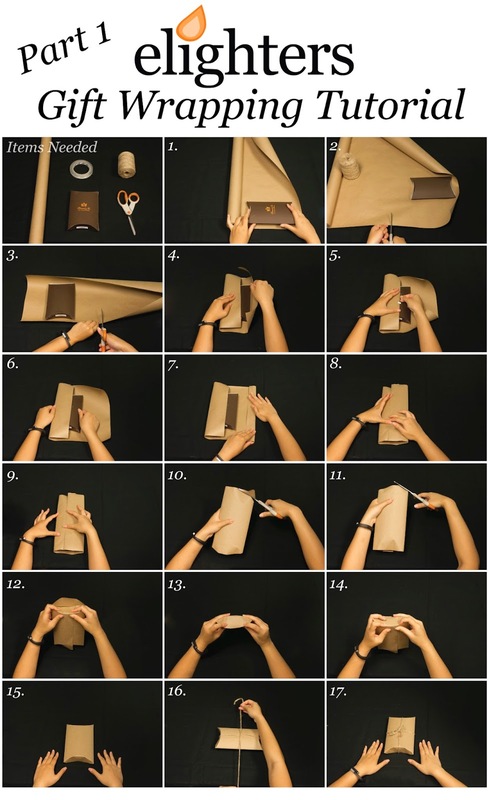 Learn How to Gift Wrap with eLighters! Ever wanted to learn how to gift wrap with things you already have around your house? Read on! 1. Lay the item you’re going to gift wrap on the paper and flip the item on its side (for the pillow box, it’s only twice) to measure out how much paper you’ll need. Wherever the item stops, add an additional ¾ inches to 1 ½ inches of extra paper. 2. Leave extra paper space above and below the item to make sure you cover the bottom of the gift and then begin to trim. 3. Cut the paper to the spot you measure out in step 1. 5. Tape the paper to the gift. 7. Fold the edge of paper so you have a clean folded line when you bring the paper back over. 8. Fold the paper over and smooth it out. 14. Tape down the edge. You may need more than 1 piece to make it more secure. 15. Ta-da! You are finished wrapping. 17. And this is the final look!